Have fun with your friends and family with this Enchanting Chocoholic's Holiday Gift Treat and enhance your celebrations. 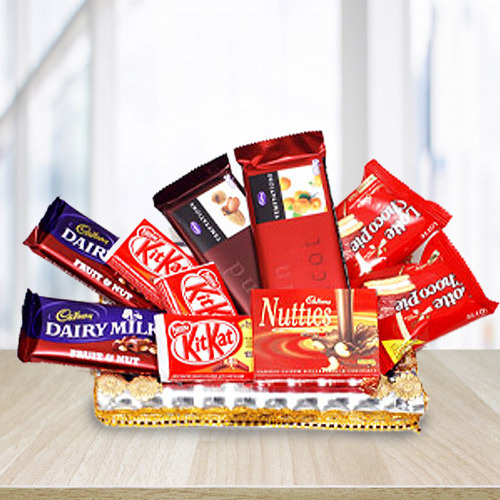 This great combination is composed of Lotte Chocopie, 3Pcs Nestle Kitkat Chocolates, 2Pcs Cadbury Dairy Milk Fruit and Nut Bars, Cadbury Nutties and 2Pcs Cadbury Temptation Chocolates. These Chocolates are exhibited in an embellished Tray. Flowers Delivery Bhilai, Send sweets Behrampur, Wedding Cake Karur, Diwali Mithai Aligarh, Send Flowers and Gifts to Bhavnagar, Online Shop Ernakulam, Flower to Goa, New Year Flowers Bellary , Fresh Fruits Khanna, Send Gift Surat, Dry Fruits to Bhavnagar, Birthday Delivery Muzzafarnagar, Sending to Palghat, Flower shop Jamshedpur, Tellicherri Online Cake Delivery.